There’s a restaurant in Berkeley Springs, West Virginia that is amazingly delicious. It’s the second time I’ve been to it and its definitely becoming one of my favorites. Panorama At the Peak serves farm-fresh, seasonal food with a great view. During my last visit, I ordered stuffed acorn squash with spinach, mushrooms, cranberries and about a thousand other delicious ingredients, but had a touch of food envy when my aunt’s order arrived: pot roast. Prior to this year, I had been a vegetarian for six years. I haven’t had pot roast for years, so you can imagine why I longed for it so much. So, I googled “gluten free pot roast slow cooker” and used the first recipe I found and modified it a bit because I HATE, HATE, HATE cooked carrots. My comments in asterisks below. 2 onions, sliced in rings *Way too many onions. I’d cut this in half next time. 1 cup ketchup *I ran out of ketchup and used 1/4 cup of BBQ sauce. Between all of the onions and ketchup/BBQ sauce, it came out really sweet. It was fine, but I was craving a more savory pot roast. 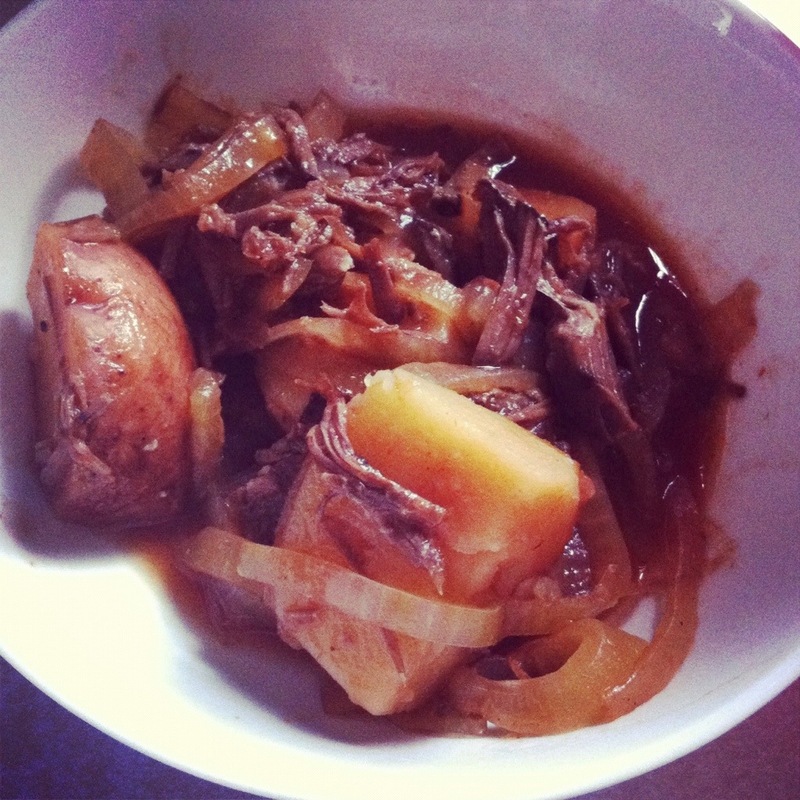 Click for original Crock-Pot Beef Pot Roast recipe, which includes carrots and peas.